Why V7 Cables? Selection - Choose from a wide variety of length and colour options. 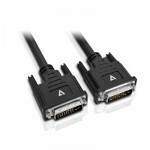 Pricing - V7 cables are competitively priced and affordable. Dependability - V7 cables are factory terminated and tested to ensure the highest levels of performance and reliability. Guarantee - V7 lifetime warranty against material or manufacturing defects keeps you worry-free.